Not all SUVs need to be the biggest thing on the road. Take the 2016 Ford Edge, for instance. It'll fit your family of four with room to spare and still fit into your garage with ease. It also boasts the latest technology, a smooth ride and a wide range of engines. Is it enough SUV for your needs? The 2016 Ford Edge gains a new optional infotainment system called Sync 3. Variable-ratio steering is now available on the Titanium trim and standard on the Sport, which also gets a standard power-adjustable steering wheel and hands-free power liftgate. On the powertrain front, the 3.5-liter V6 is no longer available on the base SE, the four-cylinder engine gains an automatic start-stop function (FWD only), and the Edge Sport now comes standard with all-wheel drive. Every 2016 Edge receives a noise-reducing windshield and keyless entry and ignition, with the Edge SEL adding a standard power passenger seat. Ride quality is smoother than many of its competitors; plenty of space for passengers and luggage; interior is well trimmed with high-quality materials; base engine delivers strong fuel economy; Sport model delivers a substantial performance upgrade; many available tech and luxury features. Dodge Sprinter? No. Ford Aspire? You must be joking. Chevrolet Celebrity? Please vacate the premises. There are plenty of automotive names that don't fit the character of the car. In fact, you might even say that's the norm. But the 2016 Ford Edge bucks the trend. The name fits because the two-row Edge balances neatly between segments, providing more interior space than a small crossover without being a three-row behemoth like its Explorer and Flex stablemates. Naturally, that gives the Edge an "edge" in the marketplace, as there just aren't many crossovers that can match it across the board. The 2016 Ford Edge is available in an array of eye-catching colors, including Electric Spice, shown here. Despite its midsize footprint and generous passenger and cargo room, the Edge feels tidy and maneuverable on the road. That's due in no small part to the improvements Ford made to the body structure and suspension when it fully redesigned the Edge in 2015. The result is a crossover that exceeds 2 tons but manages to drive more like a tall sedan. Throw in the all-wheel-drive Edge Sport's turbocharged V6 and you've got a seriously speedy crossover that can challenge some luxury-branded models. For 2016, the Edge also gets a new Sync 3 touchscreen infotainment system that improves on its polarizing MyFord Touch predecessor with a simplified interface and faster response times. Even so, there are a few competitors that keep the Ford from being the decisive victor in this segment. The recently redesigned Nissan Murano includes bold exterior styling, while the Jeep Grand Cherokee offers a fuel-efficient diesel V6 engine and awesome off-road prowess. The Kia Sorento one-ups the Edge with an optional third-row seat, and it comes in a wide variety of trim levels to suit different budgets. But if you're looking for a midsize two-row crossover that hits the sweet spot in most respects, it's hard to beat the aptly named 2016 Ford Edge. The 2016 Ford Edge is a midsize five-passenger crossover SUV offered in four trim levels: SE, SEL, Titanium and Sport. Standard features of the SE model include 18-inch alloy wheels, automatic headlights, dual exhaust tips, active grille shutters, an acoustic windshield, rear privacy glass, LED taillights, keyless entry and ignition, air-conditioning, 60/40- split folding and reclining rear seatbacks, a tilt-and-telescoping steering wheel with shift paddles, cruise control, a 4.2-inch infotainment display in the center stack, a height-adjustable driver seat, a rearview camera and a six-speaker sound system with a CD player and USB and auxiliary inputs. Also included is Ford's Sync system, which features voice recognition, Bluetooth phone and audio connectivity, 911 Assist and the ability to run apps such as Spotify and Pandora through a smartphone. The SEL adds LED headlight accents, heated exterior mirrors with puddle lamps and integrated turn signals, rear parking sensors, an exterior keyless entry pad, an auto-dimming rearview mirror, dual-zone automatic climate control, upgraded cloth upholstery, an eight-way power-adjustable driver seat (with power lumbar), a six-way power-adjustable passenger seat, a leather-wrapped steering wheel and satellite radio. The SEL is available with Equipment Group 201A, which adds the Sync 3 infotainment system with an 8-inch touchscreen, two configurable screens in the instrument cluster and an additional USB port. Also included in this package are leather upholstery, heated front seats and a nine-speaker audio system. The Titanium gets the above equipment as standard plus 19-inch wheels, a hands-free liftgate, an LED taillight bar, noise-reducing front windows, upgraded interior trim, ambient interior lighting, front sport seats, an eight-way power-adjustable front passenger seat (with power lumbar), driver memory settings and a Sony 12-speaker audio system with HD radio. The aggressive lower fascia and rhombus-shaped exhaust outlets help set the 2016 Ford Edge Sport apart from the lower trims. To the Titanium's equipment roster, the Sport adds the turbocharged 2.7-liter V6 engine, 20-inch wheels, a sport-tuned suspension, unique front and rear styling, variable-ratio steering, a power-adjustable steering wheel, sport-themed interior trim and perforated leather-and-suede upholstery. Some of the fancier standard items are available on lower trim levels as options. The Technology package for the SEL, Titanium and Sport adds an auto-dimming driver side mirror, blind-spot monitoring with rear cross-traffic alert, remote start, a navigation system and a 110-volt power outlet. The same three trims are also eligible for a Cold Weather package that includes a heated steering wheel and all-weather floor mats. For the Titanium, Equipment Group 301A includes the Technology package and adds ventilated front seats, heated rear seats and a panoramic sunroof, while Equipment Group 302A throws in a lane-departure warning and prevention system, xenon headlights with automatic high-beam control, automatic wipers, second-row outboard inflatable seatbelts, a 180-degree front camera and an automated parking system. The Titanium Driver's Package borrows the variable-ratio steering and power-adjustable steering wheel from the Sport, also adding adaptive cruise control and a forward collision warning system. The Ford Edge Sport is available with Equipment Group 401A, which largely mirrors the Titanium's Group 301A but lacks the panoramic sunroof and inflatable rear seatbelts, both of which are available separately. Also on tap for Sport buyers is a set of 21-inch wheels (with optional summer tires). Optional on every Edge is a rear DVD entertainment system. Other stand-alone options, depending on trim level and configuration, include roof rails and a tow package. Several engines are offered for the 2016 Ford Edge, all paired to a six-speed automatic transmission. Standard on every trim but the Sport is a turbocharged 2.0-liter four-cylinder engine that produces 245 horsepower and 275 pound-feet of torque. Front-wheel drive (FWD) is standard, with all-wheel drive (AWD) available at extra cost. An automatic engine stop-start function is standard with FWD to help save fuel. Expect the Edge 2.0T to return 24 mpg combined (20 city/30 highway) with FWD and 23 mpg combined (20 city/28 highway) with AWD. In Edmunds track testing, an Edge 2.0T with AWD sauntered to 60 mph in a leisurely 8.3 seconds. Still, that's better than the Kia Sorento 2.0T AWD, which needed 8.7 seconds. The Nissan Murano, however, drops to the mid-7-second range with its standard V6. SEL and Titanium buyers can opt for a naturally aspirated 3.5-liter V6 that makes 280 hp and 250 lb-ft of torque. This engine is rated at 21 mpg combined (18 city/26 highway) with FWD and 20 mpg combined (17 city/25 highway) with AWD. The Sport comes exclusively with AWD and a turbocharged 2.7-liter V6 engine that churns out a stonking 315 hp and 350 lb-ft of torque. It's rated at 20 mpg combined (17 city/24 highway). The 2.0-liter and 3.5-liter engines can tow up to 3,500 pounds when properly equipped, but Ford limits the Sport's 2.7-liter V6 to 2,000 pounds because it's not eligible for the tow package. 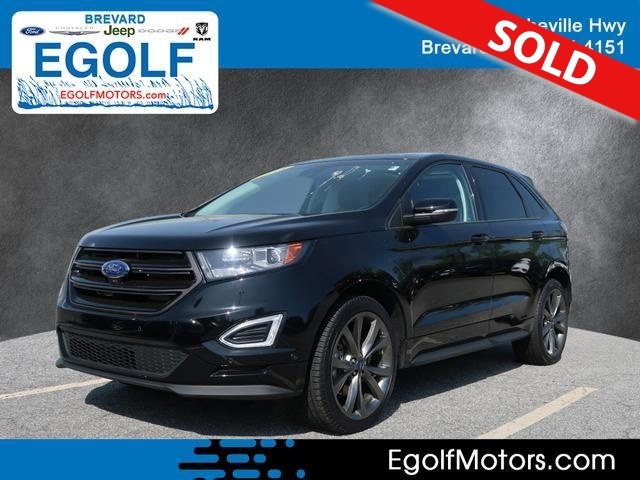 The 2016 Ford Edge comes standard with antilock brakes, traction and stability control, Ford's Curve Control, front knee airbags, front side airbags, side curtain airbags and a rearview camera. The standard Ford Sync system includes an emergency crash-notification feature that automatically dials 911 when paired with a compatible cell phone. Also standard is Ford's MyKey, which can be used to set electronic parameters for secondary drivers such as teens or valets. All but the SE also have rear parking sensors. Optional safety equipment includes inflatable outboard rear seatbelts, blind-spot monitoring, rear cross-traffic alert, a lane-departure warning and prevention system, and a forward collision warning system with brake support that pressurizes the brakes for maximum stopping power when it detects an imminent collision. In government crash tests, the 2016 Edge earned a perfect five-star overall rating, with five stars for total frontal-impact protection and five stars for total side-impact protection. In crash tests conducted by the Insurance Institute for Highway Safety, the Edge earned a top rating of "Good" in the moderate-overlap frontal-offset impact test and a second-best "Acceptable" in the small-overlap frontal-offset impact test. The Edge earned a "Good" rating for side-impact, roof-strength and whiplash protection (seats and head restraints) tests. The 2016 Edge's interior is covered with soft-touch materials on most surfaces. In fact, the dash, doors and center console are all soft to the touch from hip level and up. That means that just about every surface the driver interacts with has a quality feel. The exception is the center stack, which in standard form is adorned with hard plastic, a small display and rather basic controls. Thankfully, the optional Sync 3 infotainment system transforms that whole section of the dashboard into a sleek, modern interface. Speaking of Sync 3, we haven't tested it in the Edge yet, but our experience with the system in other Ford vehicles is that it's both easier to use and faster to respond than MyFord Touch, its much-maligned predecessor. Although the touchscreen still measures 8 inches, MyFordTouch's quadrant-based layout has been ditched in favor of a more conventional layout with clear virtual buttons arrayed at the bottom. If you're into the latest technology, Sync 3 is a no-brainer upgrade over the standard configuration, but bear in mind that you'll need at least the SEL trim level to get it. The Edge's cabin is expansive, with plenty of room for all passengers. Front-row occupants sit in supportive bucket seats, and the rear seats provide comfortable accommodations for adults. The Edge is also wide enough to make three-across second-row seating a viable proposition for families of five. The 2016 Ford Edge offers one of the roomier cargo areas in this segment, whether you fold down the rear seatbacks. Cargo space is similarly impressive. With the rear seats up, the Edge has a useful 39.2 cubic feet of cargo space available. With the seats down, that expands to 73.4 cubic feet. Both of those figures are at or near the top of the class. The 2016 Ford Edge has a controlled, carlike character from behind the wheel. It truly feels like a raised sedan, with a composed ride, direct steering and little body lean by crossover standards when going around turns. We're also impressed with the Edge's low levels of wind and road noise. There's enough refinement here to give Lincoln MKX shoppers pause, as the Edge's upscale platform-mate is, of course, considerably pricier. The turbocharged 2.0-liter engine is smooth and offers respectable passing power when required, but it's a bit sluggish off the line and clearly designed more for efficiency. The 3.5-liter V6 packs a stronger punch, but given its lower fuel economy and extra cost, we'd just stick with the base four-cylinder. If you really want power, the turbocharged 2.7-liter V6 is the way to go, delivering a serious wallop when your right foot asks for it. It sounds pretty cool, too. If we have one complaint about the Edge's powertrains, it's that the six-speed automatic transmission is sometimes reluctant to downshift when more power is needed.